Caption slip reads: "Photographer: Gaze. Date: 1956-05-03. Reporter: Gaze. Assignment: Samohi mock convention. Students at Santa Monica High School cheer keynote speaker during mock non-partisan political convention. 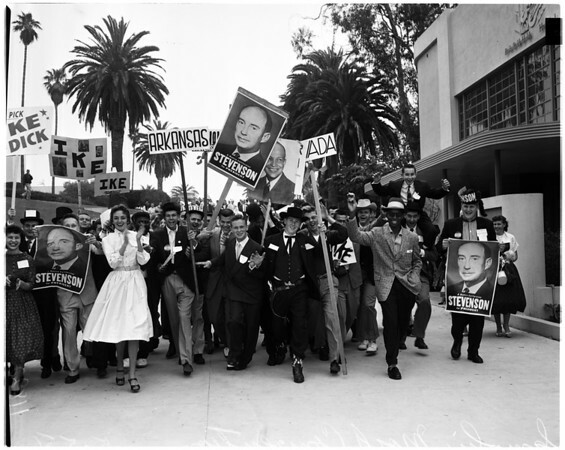 #14: Texas delegation was removed from convention hall when some members tore Eisenhower poster from speakers' platform. In center is Sergeant at Arms Bill Julian. At his immediate right is Jerry Senturia and at his left, Molly Farrant. The delegation later was permitted to return, following a public apology".